Shona Vertue helped make David Beckham more flexible - here's why you should follow suit. Shona Vertue helped make David Beckham more flexible – here’s why you should follow suit. If there was ever an icon for all-round fitness David Beckham would likely be in the running. He may no longer play professional football but, at forty-three-years of age, he still lives a healthy lifestyle, hits up the gym and is said to be big into yoga. When it comes to stretching – either around a workout or with yoga practice – men, in particular, aren’t very good at prioritising it, says trainer Shona Vertue, who’s credited with helping Beckham become more bendy. "It’s so beneficial for both men and women to move freely in their bodies from a functional perspective, but I have found that men predominantly tend to avoid stretches or any kind of flexibility or mobility routine," says Vertue, a celebrity personal trainer and yoga teacher, who also trains Gary Barlow. So, why is that the case? And why is flexibility so important, particularly for guys? "I’ve spoken to a lot of men and male personal trainers about this, and they just feel a bit stupid when they’re doing things like yoga because it is harder for them," she says. That’s because the sexes are built differently. Women naturally have a hormone called relaxin, which is handy during pregnancy and giving birth, but men don’t and it’s one of the reasons many find flexibility movements more difficult. Vertue touts the message of ‘mobility’ rather than just flexibility. "Mobility is more like your range of movement at a joint – it refers to your ability to move but also your ability to be stable in those movements," she says. "Flexibility, to be specific, is [like] being able to lie on the floor in the splits, which doesn’t necessarily have a purpose. Mobility is about being able to spread your legs really far when you run, to make you faster, or squat down deeper so you can develop more muscle tissue." Vertue says the problem is that many people look at flexibility in a one-dimensional way, for example, whether or not they can touch their toes. "Yes, touching your toes feels really good, and only being able to reach your knees don’t feel great, but that’s only one frame of movement. Being flexible or being mobile just feels better." "This is how I trick men into stretching more – it can actually help you get bigger or get stronger," she says. "When you go deeper in the movements, let’s say when you’re bench pressing if you only go halfway, your muscle doesn’t develop in the same way as if you move your full range, going a little bit deeper into the movement." Arnold Schwarzenegger once called flexibility and stretching amongst the most underrated aspects of bodybuilding, and it’s true that really utilising the range of motion at every joint, your body accommodates that range you’re going into, by sculpting the muscles around it. "If you don’t go deep into a squat, for example, you’re only going to activate or work your quadriceps, if you go deep you’re going to activate glute, or booty, tissue," Vertue says. "Basically, if you’re not moving to full range, a lot of the time you’ll miss muscles completely." "Being about to move properly is going to obviously help prevent injuries that can happen later in life, but [injuries] happen to 20 and 30-year-olds too. It’s really important at any age," she says. As we get older, joints can stiffen which can cause falls and problems with mobility and circulation. "If joints don’t get movement then the synovial fluid, which keeps the joint healthy, can’t get into the joint," explains Vertue. "It’s about prevention – the issue I have is that so many people think, ‘Oh, but I’m not old yet’. It’s important now, your body needs it now, even if you’re 20." "The great thing about David and Gary is that they both really love yoga – which helps break down this stigma that only women do yoga," adds Vertue. "Men are really starting to appreciate how yoga feels." These days yoga classes will often be an equal mix of men and women, but Vertue says if a 60 or 90-minute class is too much time to take out of your day, a 10-minute daily practice can be just as, if not more, effective in the long run. "If you tried to integrate that every single day into your life, it’s going to make a huge difference. Flexibility is accumulative, it’s got to be a constant thing, just like all exercise," she says. 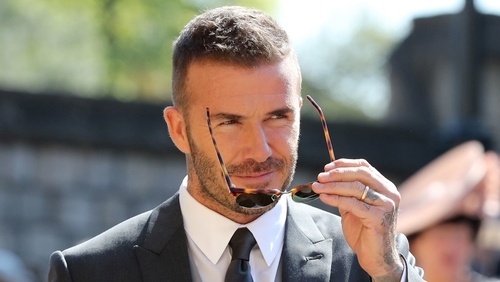 According to Vertue, Beckham and Barlow do a little every day – "It’s what I say to all my clients." She adds: "You don’t have to reinvent the wheel with some fabulously new flexibility method, but instead of squatting up and down in a very short range, try and squat all the way down – and lift lighter."